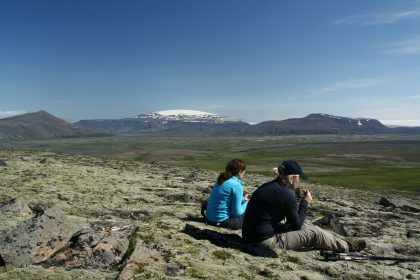 A challenging hiking tour for experienced hikers far away from civilization – combined with a few chosen highlights of icelandic nature, like Glymur, the second highest waterfall in Iceland. 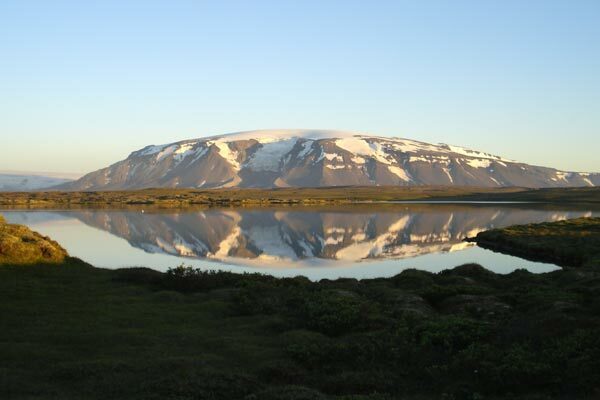 Our trekking tour leads us from highland cabin to highland cabin, away from the beaten tourist tracks, through the beautiful and secluded Arnarvatnsheiði, whose numerous lakes are rumoured to be uncountable. Alone in the wilderness, we have to forgo all modern conveniences and will experience an exceptional state: to be in harmony with oneself and with nature. Arrival and pick up at the airport in Keflavík between 15:00 and 16:30 or around 17:30 in Reykjavík. Transfer to Kirkjuból in the beautiful region of Borgarfjörður, where we will stay in a simple hotel in double or triple rooms (2x). Today, we explore the nature reserve Hraunfossar with its picturesque waterfalls and hike up the mountains around Húsafell with a view of Langjökull glacier. We will also visit Europe´s biggest thermal spring, Deildartunguhver. Drive to Iceland’s largest lava cave Surtshellir with a main passage of 1,6 km length and many side passages, where outlaws sought temporary shelter in the Middle Ages. 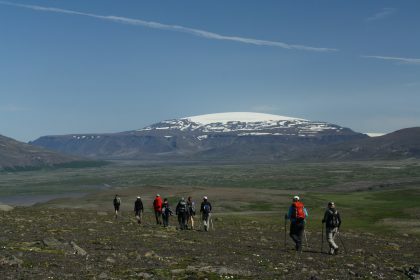 After a tour through the cave, we hike (hiking-pack) for about 6 hours through the moor Arnarvatnsheiði to the mountain hut Álftakrókur. On the way, we will have to cross a glacial river! Night-lodging in the hut (1x). Hike over rough terrain to the mountain hut Fljótsdrög (ca. 6 hours), skirting the lava field Hallmundarhraun. Night-lodging in the hut (2x). We walk only with our day pack to the unnamed crater from which the 50-km-long lava flow issued. We are now quite close to the glaciers Eiríksjökull and Langjökull and enjoy the amazing view froom the edge of the crater. We cross moraine hills and pass the lake Arnarvatn on our way to the hut Lónaborg (hiking baggage). Up until now, we have seen few other living things in the landscape around us. 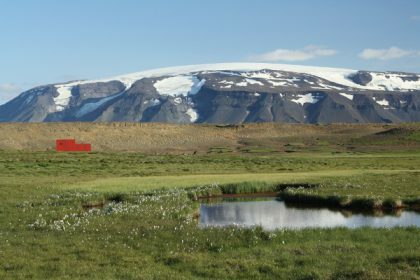 The sparse, but nonetheless beautiful sub-arctic flora and fauna now attract our attention. Night-lodging in the hut (2x). Relaxing day! We explore the area around hour hut Lónaborg (no baggage) and fish together for our lunch – a challenge for fishermen! After a 12 km hike (hiking baggage), we meet a gravel road, where a minibus is waiting to bring us down to the farm land to the guesthouse Brekkulækur. Overnight stay in double/triple rooms (2x). Sightseeing trip to the seaside to the beautiful peninsula Vatnsnes with Iceland´s biggest seal-colony, bird-cliffs and a walk on the black beach with a view of unique basalt formation Hvítserkur. Afterwards relaxing in the natural hot water swimming pool in the village Hvammstangi. After breakfast transfer to Reykjavík and drop off for guests that have booked the tour with 9 nights. Guests who have booked 10 nights have the possibility for private sightseeing and shopping, followed by an evening transfer to the guesthouse in Keflavík (1x). Transfer to the airport and flight home. 9/10 nights in guesthouses, very simple huts. For 7 nights you will need your own sleeping bag. No single rooms possible. Full board (breakfast, picnic, dinner) starting with dinner on day 1, ending with breakfast on day 10. Day 11 no breakfast early morning flight.